And although, yes, I do eat everything I post on this blog, I do try to give away some for friends and coworkers whenever possible and to keep a somewhat healthy “diet”. Nowadays I’m much more aware of what my body needs to survive a busy day. And I’ve noticed that if I don’t eat periodically – let’s say every 3 hours or so – the Incredible Hulk takes over my body and I eat whatever I see in front of me. Which usually is M&Ms and Kit Kats at work in the theaters. Not so good of a choice, right? So now that I’m old – and wiser! lol – I know I have to eat well during the day and carry food with me, so I don’t end up spending money and/or making bad choices. They also have other yummy flavors like Almond Toffee Crunch, Bing Cherry & Almond and Oatmeal Chocolate Chunk! They are all high in protein, 200 calories or less and gluten free! The perfect blend of simple, wholesome ingredients in one tasty, on the go, feel-good treat. Because snacking should always be simple, even when your life isn’t. Seriously…How nice is it to stop in the middle of a chaotic day, press pause and focus on YOU? 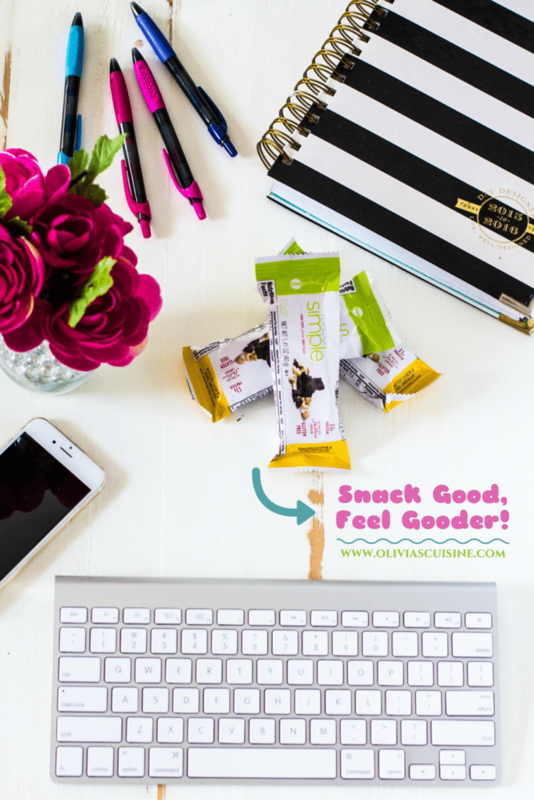 Even if it means taking 5 minutes to drink a smoothie or eat a delicious feel-good snack like the Perfectly Simple bars! Those little simple moments make me realize I’m strong and I can get through any awful day. I confess it can get a little overwhelming being a full time blogger, Broadway bartender, wife and dog mommy, especially when you have anxiety like I do! If you’re on a similar boat, make sure you have a few minutes a day to focus on yourself, nobody else. Schedule them if you must! But take time to do what makes you happy. I hope you guys have a wonderful week, full of “you time”. Remember, life happens during those little moments! P.S. Don’t forget to grab your coupon to save $1.00 off ZonePerfect Perfectly Simple Bars. Ha! The title of this post had me cracking up! Loves it! I keep seeing perfectly simple bars on other people blogs and I have been meaning to try them out! Need to hop on that band wagon, huh? I’m all for healthy deliciousness and not so much for diets! Ick!!! I can’t believe you ate carrots for a week straight.. crazy girl! But, I’m sure you have great vision now! Lol! Thanks for the reminder to add these to my grocery list! Cheers, girlfriend!